One day, my lovely wife came up to me wanting to try out a bar in Milwaukee called 42 Lounge. We were free that weekend, booked an Airbnb, and drove up almost immediately. That Saturday was a bit rainy, damp, and chilly (which seems to be the majority of days we take off randomly like this), but the Sunday morning was bright and sunny, but still rather chilly. Otherwise known as Wisconsin in March. Upon arrival in the late afternoon, and checking into our room, we needed dinner before hitting up the bar. 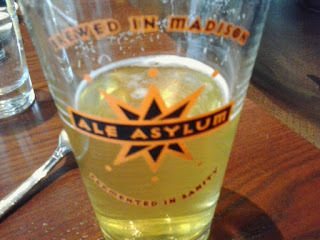 We took to an Ale Asylum location on the riverfront (Milwaukee River) downtown. 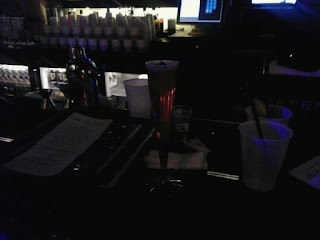 After dinner, despite the cold and the rain, we walked to 42 Lounge. It was amazing. More details below. After a good few hours at 42 Lounge, we took an Uber back to our room, and the Uber driver told us to go to Café Benelux in the Third Ward. Here we found one of the few restaurants in the States that serves poutine! Any long time reader of this blog will know that my wife and I love our poutine! 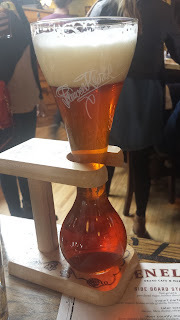 Also, they serve beer during breakfast hours, even on a Sunday! 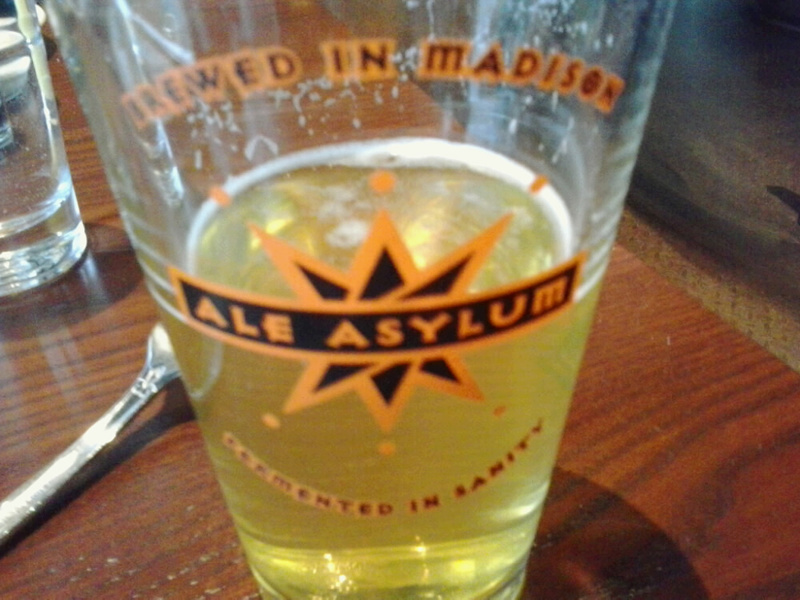 If I was not already impressed with Milwaukee before, I sure was then. Seriously, beer for breakfast in a public location! Now there is a liquor law I can get behind. 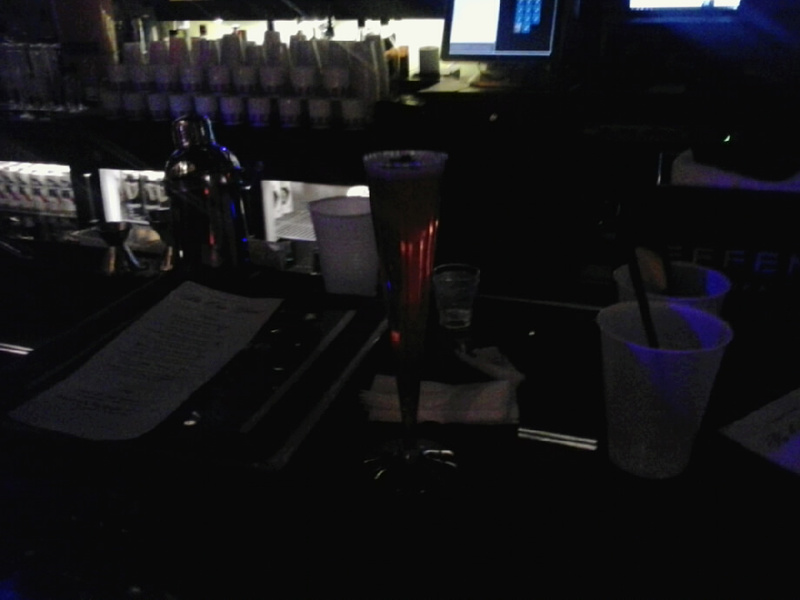 The main purpose of the trip was to try out 42 Lounge;. Both my wife and I fully embrace the “geek” or “nerd” culture, and this bar caters to this crowd. The name of the bar itself is “nerdy.” 42 comes from the Answer to the Ultimate Question of Life, the Universe, and Everything from Douglas Adams’s The Hitchhiker’s Guide to the Galaxy. The logo is written in pixels. The cocktails are themed, such as the Pan-Galactic Gargle Blaster from The Hitchhiker’s Guide to the Galaxy, a drink so strong, that it “is like having your brains smashed out by a slice of lemon wrapped round a large gold brick.” Plus mead. So much mead. That alone made my night finding that out. Their nights are themed, such as D & D Sundays and Hearthstone Mondays. Not only can you drink there, but you can also play games, both the video and board varieties. After ordering a drink, you get to pick a game out of a binder, and you get to play it. They have Xbox 1 games, PlayStation 4, Nintendo Switch, and more. Be sure to keep your drinks coming. The night we made it to 42 Lounge they were hosting a Beauty and the Beast themed party in response to the new movie starring Emma Watson that had released earlier that week. Patrons, or guests, were to either cosplay as a character, or come dressed in (semi-)formal attire (no one was dressed in formal white tie, but there were plenty of semi-formal black tie). The drinks were themed, with my favourites being rose champagne garnished with rose petals, or the Gaston’s No Belle Prize shot (whatever was in that shot was delicious). Thank God for Uber after that evening. 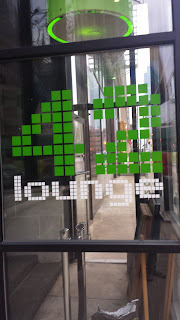 We enjoyed ourselves immensely, and when we go explore Milwaukee fuller in the future, we will make sure that we make it back to 42 Lounge multiple times.